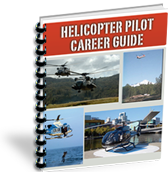 Our free guide gives you an overview of the exciting positions available as a professional helicopter pilot. Fill in your name and e-mail address in the boxes below and you'll also get a free e-logbook and resume/cover letter advice. You might have heard about the helicopter pilot shortage. You might have heard that this is a great time to become a helicopter pilot.Both of these statements are partially true. In reality, there is a shortage of experienced helicopter pilots and while this is a good time to become a professional helicopter pilot it's not the greatest but it is far from the worst. The decision to become a professional helicopter pilot is one that should not be entered into lightly. Training can be expensive and its important that you're able to maximize your learning while minimizing the amount of money you spend. If you're a new helicopter pilot you need to concentrate on getting experience or in layman's terms, landing that first job which incidentally just might prove to be the most difficult of your entire career. You are competing against thousands of others and all of you have little or no experience. How do you separate yourself from the pack and get the position that so many others want? If you're an experienced helicopter pilot you face some of the same challenges. Take a look at a job search from a employer's perspective. The employer has resumes from ten pilots that meet their qualifications. They will only hire one. Each potential hire has about the same number of flight hours (maybe you have less) and experiences (maybe you have fewer). Why should the employer choose you over the guy to the left of you or the gal to the right. That is the question you need to ask yourself and that is the question that we want to help you answer. At Helicopter Pilot Careers we speak with pilots who are or have been in the same positions that you want. We consult with hiring managers and others responsible for employing helicopter pilots to find out what they like to see from a potential candidate. We have relationships with other helicopter industry insiders to keep our finger on the pulse of the industry so that we can provide you with strategies, tips, and techniques that you can leverage to get the position that you want. Presently, the off-shore support industry is the largest employer of helicopter pilots worldwide and the increasing global demand for energy will require more helicopter pilots to support exploration and production. Additionally, helicopters are being used more now than in any other time in history in fields such as Law enforcement, Electronic News Gathering (ENG), Emergency Medical Services (EMS), aerial fire fighting, tour/charter, construction, movie and film production, the military as well as a number of governmental agencies. As an aviation professional I know you work hard but as you know working hard isn't enough. You need to work smart. If you haven't done so, fill out your first name and e-mail address in the form above. You'll receive our free career guide as well as a free e-logbook and resume/cover letter advice. More importantly you'll be taking the first step to the career that you've always wanted. The information that you provided helped me choose exactly what type of helicopter pilot I want to be. In fact I took your free advice from the resume and cover letter videos and landed my first paying job. I've just begun my flight training with a school in the south eastern U.S. I'm finally on my way to being a commercial helicopter pilot and ultimately a corporate pilot.